At the time, the United States was still trailing the Soviet Union in space developments, and Cold War-era America welcomed Kennedy’s bold proposal. In 1966, after five years of work by an international team of scientists and engineers, the National Aeronautics and Space Administration (NASA) conducted the first unmanned Apollo mission, testing the structural integrity of the proposed launch vehicle and spacecraft combination. Then, on January 27, 1967, tragedy struck at Kennedy Space Center in Cape Canaveral, Florida, when a fire broke out during a manned launch-pad test of the Apollo spacecraft and Saturn rocket. Three astronauts were killed in the fire. Despite the setback, NASA and its thousands of employees forged ahead, and in October 1968, Apollo 7, the first manned Apollo mission, orbited Earth and successfully tested many of the sophisticated systems needed to conduct a moon journey and landing. In December of the same year, Apollo 8 took three astronauts to the dark side of the moon and back, and in March 1969 Apollo 9tested the lunar module for the first time while in Earth orbit. Then in May, the three astronauts of Apollo 10 took the first complete Apollo spacecraft around the moon in a dry run for the scheduled July landing mission. 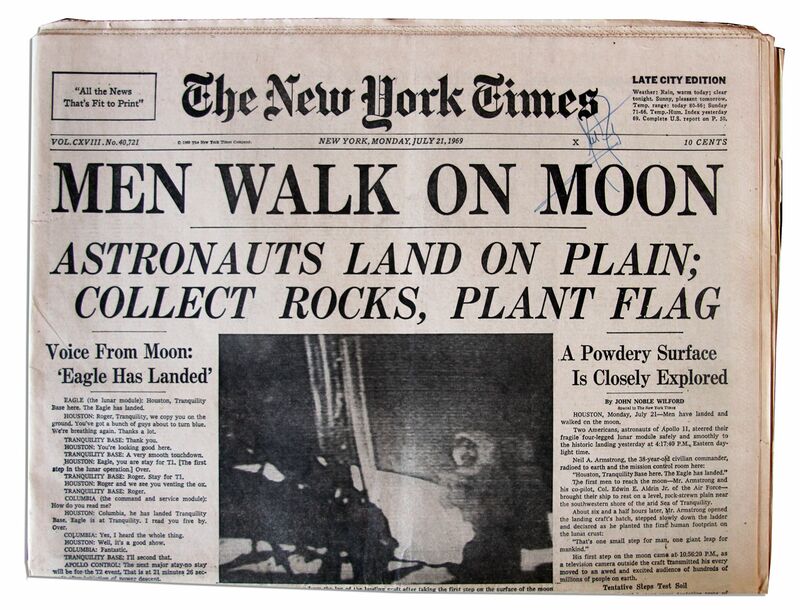 At 9:32 a.m. on July 16, with the world watching, Apollo 11 took off from Kennedy Space Center with astronauts Neil Armstrong, Edwin Aldrin Jr., and Michael Collins aboard. Armstrong, a 38-year-old civilian research pilot, was the commander of the mission. After traveling 240,000 miles in 76 hours, Apollo 11entered into a lunar orbit on July 19. The next day, at 1:46 p.m., the lunar module Eagle, manned by Armstrong and Aldrin, separated from the command module, where Collins remained. At 10:39 p.m., five hours ahead of the original schedule, Armstrong opened the hatch of the lunar module. As he made his way down the lunar module’s ladder, a television camera attached to the craft recorded his progress and beamed the signal back to Earth, where hundreds of millions watched in great anticipation. He then planted his left foot on the gray, powdery surface, took a cautious step forward, and humanity had walked on the moon. “Buzz” Aldrin joined him on the moon’s surface at 11:11 p.m., and together they took photographs of the terrain, planted a U.S. flag, ran a few simple scientific tests, and spoke with President Richard M. Nixon via Houston. By 1:11 a.m. on July 21, both astronauts were back in the lunar module and the hatch was closed. The two men slept that night on the surface of the moon, and at 1:54 p.m. the Eagle began its ascent back to the command module. At 5:35 p.m., Armstrong and Aldrin successfully docked and rejoined Collins, and at 12:56 a.m. on July 22 Apollo 11 began its journey home, safely splashing down in the Pacific Ocean at 12:51 p.m. on July 24. There would be five more successful lunar landing missions, and one unplanned lunar swing-by, Apollo 13. The last men to walk on the moon, astronauts Eugene Cernan and Harrison Schmitt of the Apollo 17 mission, left the lunar surface on December 14, 1972. The Apollo program was a costly and labor intensive endeavor, involving an estimated 400,000 engineers, technicians, and scientists, and costing $24 billion (close to $100 billion in today’s dollars). The expense was justified by Kennedy’s 1961 mandate to beat the Soviets to the moon, and after the feat was accomplished ongoing missions lost their viability.